Gather Everyone Up & Enjoy a Hearty and Savory Low Carb Zucchini Harvest Bake! HIGH PROTEIN VANILLA PANCAKES – THINK FUNNEL CAKE! 14 GRAMS OF HEALTHY PROTEIN PACKED IN 2.5 DELICIOUS PANCAKES! SOON TO BE FAMOUS FAMILY FAV RECIPE! POP POP MERCER’S ITALIAN STYLE ZUCCHINI & GREEN BEANS! FUNNEL CAKE! That best describes the lovely aroma of these delicious HIGH PROTEIN panakes that use the BEST tasting protein powder – and which is full of SUPERFOOD Nutrition! We’re talking 14 grams of high quality protein in 2.5 pancakes! 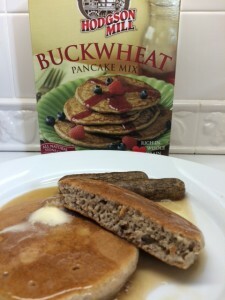 The first 3 people to sign up as a RETAIL or LOYAL customer to get the CREAMY VANILLA PROFIT Protein Powder to make these delicious pancakes will get a FREE box of the HODGSON MILL BUCKWHEAT Pancake Mix!! Want to buy the Creamy Vanilla Protein Powder? Enter my website directly into your address bar: http://jmercer.myitworks. com (make sure to enter with no spaces) and click on SHOP! You can sign up as a RETAIL customer or a LOYAL (LC) customer. If you sign up as a LC you will need to sign up for 3 months, and that entitles you to get 40% off the retail price plus FREE shipping after 3 months! It makes a big difference! For instance, as an LC, you can get the 30 serving package of CREAMY VANILLA ULTIMATE PROFIT® at 40% off or $69! You can also order it as a RETAIL customer for $115 without signing up for the 3 month minimum. Our 5 most popular recipes in one book, with expanded descriptions, full-color photos, and updated nutrition information. Available in traditional paperback and on the Kindle. A Miracle Come True: Trader Joes Shrimp Stir Fry + Miracle Noodles = O Carb Meal in 15 Minutes!